The Phone LG V30 was launched in 2017. Established long back in the year 1958, LG has gone through various phases since then. It has revealed many new products and modern technologies for improving the digital lives of the individuals. The vision of the company is to become the leading company in the market to get recognised in the wide market of the technologies. With the contract development processes of the company, it can easily obtain success in the ethical management. Besides TV, washing machine, induction cooker, microwave oven, refrigerator, the company also has a significant presence in the mobile phone market. It helps you in staying connected with the mobile devices. The models range from the basic phones to the high-end range smartphones, and you can select whichever is convenient for you. Every LG phone is customised to suit your lifestyles and provides you with the access to the updated features and new technologies. LG V20 can be considered as the predecessor of this particular model V30. The phone has a display size of 6.0 inches, the display type being P-OLED display. The phone is almost bezel-less with an 81.22% screen-body ratio. The display of the phone has a QHD+ resolution (1440 x 2880 pixels) with a pixel density approxmately 537 ppi. The display is capacitive multi-touch and supports upto 10-points of multitouch. It is by default, protected by Corning Gorilla Glass, given that the device sits in the premium range. The design part is highly attention seeking and LG V30 does succeed in catching the attention of its users. The phone has a metal body and soprts the camera panel on the back, with the fingerprint scanner right below it. Control buttons reside on the left side of the phone, and the front camera sits beside the speaker grill. The phone measures 151.7 x 75.4 x 7.3 mm and weight 151.7 grams. Available in black, silver, blue & violet colours, the phone looks beautiful to hold and maneuver around. Also, the phone is IP68 certified dust/waterproof, i.e. can stay under water for 30 minutes till a depth of 1m. The LG V30 can be considered as the first phone with Android v7.1.2 (Nougat) factory shipped by LG. The device's hardware is pretty robust with an octa-core SnapDragon 835 MSM8998 chipset with the Adreno 540 GPU for graphics. Every flagship phone with this configuration has proven itself to be a great performer for heavy computing and is surely a great processing power that we'll get to witness in the LG V30. The processors, 4 x 2.45 GHz Kryo 280 + 4x 1.9 GHz Kryo 280) are built on a 64-bit architecture design and are coupled with 4GB of LPDDR3 SDRAM for heavy multi-tasking. The phone wouldn't show any signs of lag even after more than a dozen apps run on it. The inbuilt storage capacity is 64 GB with 4 GB RAM. A 3-choose-2 microSD card slot can expand the storage by upto 2TB in this phone. The phone also supports dual-SIM (nano+nano) with support for 4G, 3G and 2G bands with Qualcomm's Quick Charge support included in the configuration specs. Just like the predecessors, the LG V30 has a dual lens (16MP f/1.6, 3-axis OIS + 12MP f/1.9 telephoto) camera with PDAF & Laser AF. The camera supports Exposure compensation, ISO control and has a 1μm pixel size. Like every other smartphone, the camera of the LG V30 is equipped with geo-tagging, touch-focus, face detection, HDR, panorama etc. The front camera will be a 5 MP AF camera w/ f/2.2 aperture lens, 1/5" sensor size and 1.12 μm pixel size. The given specifications are sure to capture sharp and superfast focussed images. On the video part, the cameras will be able to capture videos in many different resolutions - 2160p@30fps, 1080p@30fps, 720p@120fps 4x slow-motion, 24-bit/192kHz stereo sound rec., HDR video. The high-quality audio output of Quad DAC with ES9218 can provide you with good music with the help of the premium headsets. The company is offers premium headphones with B&O with this device. The audio jack of 3.5 mm and no FM radio features will be present. The phone will support MP3 and WAV ringtones. The microphone of the V30 will feature active noise cancellation. The phone was revealed to have a 3300 mAh non user-removable battery, Li-ion type with 36 hours talk-time on 3G networks. The battery should last through the day easily with light to moderate usage. Although the phone could use a little more battery capacity, this much is just fine. The phone will be Fast battery charging supportive (50% in 36 min, Quick Charge 3.0) and will also support Wireless charging, although the hardware have to purchased separately. On the connectivity part, the LG V30 will support the following 4G Bands: TD-LTE 2300(band 40) FD-LTE 1800(band 3). The 3G Bands supported are: UMTS 1900 / 2100 / 850 / 900 MHz, and the 2G Bands as follows: GSM 1800 / 1900 / 850 / 900 MHz GPRS:Available EDGE:Available. Other wireless connectivity features include Wi-Fi IEEE 802.11 a/b/g/n/ ac standard, dual-band (2.4-5 GHz) w/ Wi-Fi Direct, DLNA and hotspot. The phone will have Bluetooth v5.0 w/ A2DP, LE supprting AptX HD voice. The phone's GPS supports A-GPS & GLONASS but no BeiDou & Galileo. There is no FM radio, but does have NFC. For wired connectivity, The phone will support USB-C port for connecting to PC as well as as the charging port. The sensor features on the phone are expected to be gravity sensor, light sensor, fingerprint (rear mounted), accelerometer, light spectrum and proximity sensor. There are many benefits of this phone , but you cannot ignore the drawbacks. Here are the details. How much battery capacity does it have? Does it support fast-charging technology? The battery of LG V30 is backed up with 3300mAh, a non-removable battery. The device comes with quick-charging feature. Yes, it features with wireless charging support. Is LG V30 comes with water/dustproof? Yes. LG V30 is rated with IP68 water/dust proof, which means water resistant up to 1.5 metres for 30 minutes. How much memory options it comes with? The device has been launched with 2 memory configurations i.e 64GB with 4GB RAM, and 128GB with 6GB RAM. There is also microSD card slot that can be expanded by up to 2TB storage additionally. Does it feature dual-primary cameras? If yes, what are the resolutions and pixels? Yes, LG V30 has dual-lens camera on the back panel. The main lens has a 16MP sensor with an f/1.6 aperture lens(regular focal length), while the secondary lens has a 13MP sensor with f/1.9 aperture wide-angle lens. What camera is present on the front? On the front, it has 5MP sensor with an f1/2.2 aperture lens. What security options are present to make this device safer? The phone is secure with lot of options present for unlocking such as face-recognition, voice-recognition, fingerprint scanner, knock-knock, and PIN options. What is the display size and type of the device? LG V30 has 6-inches OLED Full Vision display technology. It has the resolution of 2880 x 1440 pixels. It is QHD+ display and gives best user experience by offering great viewing angles. What OS does this device runs on? It runs on Android 7.1.2 Nougat pre-installed with LG’s custom interface. Which chip LG V30 is powered by? LG V30 uses Qualcomm Snapdragon 835 chipset. It will surely give you the best gaming experience and also best suited for multitasking. Does it have protection of Gorilla Glass protection? Yes. On front and back side, the device has Gorilla Glass 5 protection. Is there any special feature included? The device is military tested i.e it has passed 14 different MIL-STD 810G Tests, so it gives more durability to LG V30. When it is launching in Dubai, UAE? 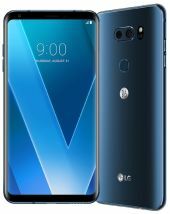 LG V30 goes on sale on September 21 in Korea, followed by other markets including Middle East.